Streetsblog sat down with Supervisor Scott Wiener in an unofficial district office (aka: Castro Tarts) on Friday. Photo: Streetsblog. 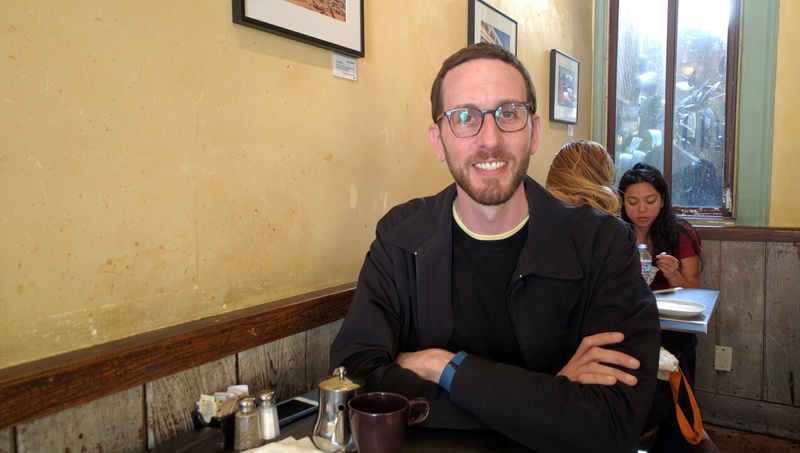 On Friday, Streetsblog caught up with District 8 Supervisor Scott Wiener. Readers may recall that Streetsblog last interviewed the then newly re-elected chair of the San Francisco County Transportation Authority back in January. Since that interview, much has changed. The mayor has a new Executive Directive on Vision Zero, a new city sales tax initiative is scheduled for the November ballot that will be integral to the budget and transportation investment, and there is a new interim police chief. Moreover, Wiener is now locked in a close fight for the State Senate District 11 seat for San Francisco and San Mateo County with Supervisor Jane Kim. Given all that, Streetsblog thought it was time to get the latest from Wiener. Streetsblog: You recently wrote an editorial advocating for late night service on BART and Muni. I know you’ve been working for some time on late-night service options. Do you envision that as bus-only, bus-plus-Muni rail, or do you see a scheme of, say, single-tracking through the Transbay, so it would include some BART service too? Scott Wiener: Obviously, the easiest late-night transportation expansion is going to be a bus service and that’s been a big focus. Improving the owl service—making it more frequent and expansive; not having to tour the whole city to get home. And we want to increase Transbay late-night service to make it truly usable. We’ve made progress, and there will be more. I’d absolutely like to see overnight rail service. I’d like to see Muni run the subway later too—at least on the weekends until 2 a.m. In terms of BART—we’ve been struggling for so long. They insist they can’t do 24-hour service. I’ve heard conflicting things about whether BART has enough of a “can do” attitude. But they are emphatic about the impossibility of running overnight. So we need to keep a second Transbay tube on track, which will allow for 24-hour BART. Of course, it’s not just about 24-hour capacity; it’s about redundancy. It’s about connecting Caltrain, the Capital Corridor, and getting HSR over to the East Bay and Sacramento. SB: Supervisor Peskin proposed a motion to oppose the Governor’s “by right” housing proposal. You accused your fellow Supervisors of “sour grapes” on this. First of all, why, in a city with such intense housing demand, is there so much resistance to building more housing? W: I’m in support of working with the governor to improve his proposal to address some of the problems with it. That’s what my alternative resolution laid out. For example, he makes it too easy to demolish rent-controlled housing. It needs to be changed and the governor has indicated that he is open to negotiations on it. And so my perspective is: instead of a knee-jerk opposition reaction, let’s work with the governor and tell him what needs to be changed. And let’s recognize that SF does not get an A-plus for housing policy. Residents are paying $3,500 per month [for a tiny apartment] and people are getting evicted and displaced. Let’s stop pretending that everything is just fine. I give the governor a lot of credit for stepping up on housing and housing affordability. The state historically has not played a big role in housing and the fact is our housing prices are regional and statewide—not city by city. It is threatening the economy and the environment and the diversity of our entire state. SB: I think it needs to be added that this city, let’s face it, is filled with old, crappy—frankly dangerous—historic buildings. They’re also not nearly the density we need. Nobody wants to talk about it, but isn’t it time to take a wrecking ball to some of this housing before we have another earthquake and a bunch of people die? W: We’ve been trying to shore up a lot of our buildings. Our seismic retrofit mandate is important and, as painful as it can be for some property owners, it’s all phased and the first phase is going through now. They’re about to hit the deadline. We’ve been trying to help landlords fix code problems in their buildings. Some of the Mission fires resulted from having a ton of old, wood-framed buildings with old electrical wiring, all packed closely together. We’re trying to help owners make wiring safer. We’re seeing lots of buildings being renovated now where they preserve the facade but make changes to the rear. But no city remains stagnant; there will be changes in the building stock. The question is, how do you best balance our shared love of the architecture and the fabric of the city with the need for change? SB: It’s been over a month since the deaths of Kate Slattery and Heather Miller. Mayor Lee has finally issued an Executive Directive to accelerate safety improvements. But why did it have to wait until two people died on the same night? That horrible night didn’t really highlight that the areas where they were killed are dangerous; we already knew that from the slow trickle of deaths and injuries. Why do we wait until some tragic spectacle to react? W: The scale of what we need to do is very large and so sometimes it’s easy to have inertia. We also know that we have cultural issues within our city agencies where at times things just don’t move and are very methodical. But we also know that each of these Vision Zero projects are controversial; not within the transit community, but when you’re talking about traffic calming measures that reduce lanes and slow speeds, there’s often pushback and we see it everywhere. We’re getting pushback to our plans for Upper Market. There was pushback on some of the South of Market project. We have pushback on Mission. Pushback on Taraval. Pushback on Geary. Everyone is entitled to a point of view… but that pushback makes the process go slower. There are times when the MTA doesn’t want to pick too many fights, so they pick their battles. They have huge battles on Taraval and Mission and there’s a variety of reasons why these projects move so slowly, but there’s more and more a sense of urgency within the bureaucracy and City Hall to make the projects go faster. SB: Do you have faith in the mayor and the SFMTA following through this time, when—let’s face it—they haven’t before? W: I think the Executive Directive will have a positive impact as long as the Mayor’s Office insists that it does. The Board of Supervisors can pass every law in the world. The mayor can issue every Executive Directive. But it’s up to the agencies to enact them. When I pass legislation I have to really watch and push and insist that they move forward to implement that law and I think the same is true of the mayor. I truly believe that the mayor is committed to Vision Zero; I believe the mayor is frustrated with the slow pace. SB: But this is the same mayor who vetoed the Bike Yield law. Back then, there was talk of reintroducing it as a pilot program. Given the Executive Directive, is it time to see if the mayor might have changed his stance on that as well? SB: —you were a big supporter. W: I was the first co-sponsor and I was very supportive. And I was disappointed it didn’t go through. Clearly we don’t have the votes. If there’s an opportunity to try a pilot program, to show that the sky won’t fall [nods]. I don’t know if the mayor will shift, though. Right after we announced it, it was very clear Mayor Lee was not a fan; I’d be cautiously optimistic about the prospects for a pilot. SB: A few months ago the SFMTA started procedures to fire a bus driver for using a racial slur. Certainly, that was horrible. In late June, after the deaths of Kate and Heather, Streetsblog ran a story about an SFMTA enforcement officer—someone whose job it is to keep us safe—who blocked the bike lane on Market Street with his car in a non-emergency situation. So when an SFMTA enforcement officer places a city car right in the middle of the bike lane on Market—which could get someone seriously injured or killed—it is not time to fire him, but if someone uses an extremely offensive word, it is? I’m not following that logic. W: What I will say is my perspective is neither the SFMTA or SFPD takes double-parking seriously. And I don’t say that lightly. I’m a fan of both agencies. I work with them. I believe SFPD and SFMTA are committed to Vision Zero. There are some really good people within SFPD who do want to see it happen. But double parking is one area where both agencies have just failed… it’s private automobiles, it’s taxis, it’s garbage trucks… it’s an unending situation. They cause traffic jams, they block Muni, they block the bike lane, it undermines our entire transportation system and makes our streets more dangerous. It is one of my significant frustrations. I’m not permitted to advocate for the hiring, firing, or rewarding. I will just say that on those hypotheticals, that is indicative of the agency’s general laissez-faire approach to double parking. When we were having disagreements with the fire department, the chief said, why don’t you go on a ride-along on a truck? And we said: let’s also do a bike-along. Leah Shahum and Nicole Ferrara and one or two people from SFMTA rode along. That ride-along showed that the bulb-outs were not a problem for the fire department; but fire trucks were getting stuck behind double-parked cars. The driver of the truck said yes, there are a number of streets where he has to look down a street for double-parked cars and if he sees one he has to take a different street. I repeatedly expressed to the fire department that double parking is a fire-and-life-safety issue and the fire department should be beating the drum on SFPD and SFMTA on double parking. SB: There will be a .75 percent sales tax hike, assuming the voters approve it, that will result in a 9.25 percent sales tax rate come April 2017. Putting that measure on the ballot was passed by the SF Supervisors. But not everyone voted for it. Jane Kim, your opponent for the California Senate, saw the increase as regressive. Is it? W: That is one of the most vacuous arguments that I have heard. I am so over the excuses that “I can’t support sales tax because it’s regressive.” About half of our sales tax revenue comes from business and tourists and the fact is, if you buy a fancy car you pay a heck of a lot more than if you buy a lower-priced car. To be clear, is a sales tax the most progressive tax in the world? No. We don’t have the power to levy a progressive income tax, but it’s not nearly as regressive as Jane Kim and others say, and it’s a powerful funding mechanism. San Francisco’s sales tax is lower than several surrounding counties, and state tax is going down, so part of the increase is replacing the sales tax. On top of it all is a unique opportunity for us to generate, over a twenty-year period, $2 billion for transportation and $1 billion for the homeless—talk about moving the dial and putting our money where our mouth is to improve Muni and BART and Vision Zero! What is regressive is failing to support transportation funding to improve Vision Zero, transit, and equity. The sales tax is a game changer. It will allow us to make a contribution to new BART vehicles, will let us refurbish and expand our bus fleet, allow us to modernize Muni’s maintenance facilities… at some point you need to set aside the talking points and look for solutions and the sales tax is a solution. SB: You’re running for State Senate. If you win, tell me what your first 100 days in Sacramento will look like. W: Transportation funding is going to be a massive priority in the State Senate; the state does not do nearly enough for public transportation. It always takes a back seat to freeway funding and that needs to change. We need an urban transportation agenda in California where the Bay Area and Los Angeles work together to grow the transit pie instead of fighting over crumbs. If we’re going to expand subways to Western San Francisco and the Bay View, extend Caltrain and HSR downtown, build a second Transbay tube, and do all the things we need to do to absorb the two-million population increase we expect in the next 25 years, that has to be a high priority. I will definitely be working with the transit advocacy community on progressive transportation policy, Automatic Speed Enforcement, fire code reform, and creating greater incentives for local jurisdictions to build complete streets. SB: This time I saved the silly, softball question for last. You lost the Pokemon contest to Jane Kim. One commentor on Sfist wrote “This bodes ill for Scott in November.” What do you say to that? W: Being edged out in Pokemon definitely re-motivated us to fight in November. It won’t happen again. lame, neutered interview. expected better from streetsblog. should have asked him why he endorsed the anti-bike, anti-urban idiot joel engardio. The interview took place on Friday, 8/12/2016. Joe Engardio’s article was published on 8/14/2016. For example, he makes it too easy to demolish rent-controlled housing. It needs to be changed and the governor has indicated that he is open to negotiations on it. And so my perspective is: instead of a knee-jerk opposition reaction, let’s work with the governor and tell him what needs to be changed. Where’s Chris Daly when you need him? Chris is flipping foreclosed real estate in the suburbs. Fairfield, to be precise, if you need him. My concern with the sales tax, and a number of the revenue-related measures out of the 25 local measures on the ballot in November (an utterly absurd number) is that we’re locking so much of the budget down in voter-approved spending formulas. Funding for Muni, the homeless, the arts, parks, etc… are all great, but there’s a reason we have elected officials and a city budget process, and removing discretion from that process is dangerous. A recession sometime in the next 20 years is inevitable (some would argue far sooner); we shouldn’t be locking ourselves into budget priorities for decades to come. That said, basically the only thing Willie Brown did that I can get behind is that he cracked down on double parking. It is a safety issue for literally everyone who uses the roads. Step up enforcement, yes, but also communicate to people that it is unacceptable community behavior. Where necessary, rip out more parking spaces and convert them to loading zones (with enforcement to ensure they stay loading zones) to remove the “oh but there was no place else to stop” excuse for double parking. but he never cracked down on the Sunday church going illegal parkers lol! Since we’re on the subject, Engardio’s response (https://medium.com/@joelengardio/reactions-and-response-to-my-bike-column-6dc3845cd3b6#.x1ik3nc61) is pretty weird too. He basically takes a “well I was just throwing an idea out there” approach to his article, which is one thing when you want to be a provocative opinion columnist and drum up some interest in the Examiner, but quite enough when you’re putting yourself out there as a future leader to help solve the city’s problems. And as a basic “don’t be stupid” test, an aspiring politician should know better. It’s a proposal that stirs up a ton of anger and trouble for very little gain. Also, what’s with his obsession with dividing the city into “westside” people and everyone else? I’ve lived here for decades and have never seen someone so insistent on dividing up the city like that. Yeah, because he didn’t get to be mayor by angering churchgoers. It’s a NIMBY dogwhistle. That way he can plausibly claim to be for things like improving transit or bike infrastructure — just not, you know, in his or his constituents’ backyards. To his credit, Scott is the best informed supe on transpo issues. He’s always been a good friend to the SFBC. He’s smart and analytical, and refuses to join anyones’s “camp.” I don’t always agree with him, but I admire him. (1) There are no formal plans for a second BART tube. BART has been floating the idea around for years, but when you’re dealing with an agency looking at 2050 goals, not 2020, then you can pretty much forget about it ever being built. (2) If you push for the DTX then Caltrain will be connected to BART/MUNI. Instead, it’s been labeled as an afterthought of the TTC project, not a priority. (3) Why don’t you (SW) lobby for HSR to run through the East Bay rather than the peninsula? Then run it under the bay in a new, combined BART/HSR tube. BART CAN run 24/7. This is not a technical issue; single tracking of the Transbay Tube could support trains every half hour between Montgomery and West Oakland. When the “we can’t do it” staffers give excuses, they need to be reminded the long list of portions of the NY, Chicago, and Philly systems that are two tracks just like BART and manage every night. BART is asking for a very large bond issue in November. As a condition of the bond issue, we should demand 24/7 service within 2 years and to continue until at least those bonds are paid off. 30 years IIRC, so the habit will be there and cutting back will be politically impossible. I suspect the massive bond issue is just to keep BART running and safe, and keeping the lights on. Are you sure the demand exists for 24 hour BART? Have you ever taken the last BART train out of SF at night? Is it packed with people? Or under-utilized? New York is a true 24-hour city. I’ve never thought of San Francisco in that way. Heck, most of the restaurants I like won’t serve after 9 pm. Other than partiers and clubbers, who wants to get from Market Street to Pleasanton at 3 in the morning? Could such a service be economically justified? Or if it’s just a shuttle between Montgomery and West Oakland, doesn’t a night bus work better? BART is most valuable when the roads and bridges are packed with traffic. Other than partiers and clubbers, who wants to get from Market Street to Pleasanton at 3 in the morning? San Francisco has a ton of concert venues, and the headliners typically finish up after BART stops running. And the biggest argument is the employees of all those places where people party and club, who are being priced out of SF. OK, so other than the odd concert, who? How many is “a ton”? How about some numbers? Would the ridership justify the added costs? I’m not saying there is zero demand – just not enough to justify the costs incurred. While being priced out of SF is a red herring there. That’s a housing issue. Subsidized transport has to be justified by demand and economics, and not just as a social engineering gesture. There are a ton of concert venues in SF, which by implication means that there are not “odd concerts” but many every evening. A ton? Well, there’s a lot of smaller venues and clubs, I’d agree. But not many large venues – the Warfield is a decent size but otherwise you’re talking a few hundred or so? You tell me. And no sane city designs a transit system around people who want to stay up drinking and clubbing all night. But hey, if these venues want to pay for free all-night BART so their patrons and workers can get home without springing for a cab, then fine. Just not on my dime. Look, I’m a big fan of BART – easily the best transport system the Bay Area has, and with a decent farebox recovery ratio. But if we need a second tube it is for rush-hour capacity and not a few revellers and partiers in the dead of night. BART already exists – and was designed around commuters. It’s insane to under use that investment. It’s also insane to overuse it. If you run a convenience store, do you stay open all night if only one customer comes in per hour? And he’s drunk, buys some gum, knocks over the produce and throws up on your floor? I want to see hard numbers and projections to demonstrate the viability of your expansion idea and “a ton” is as close as you have gotten to that. As stated – San Francisco is a night life town. By implication, the expansion is viable. OK so your business case is based on “implication” and vague numeric terms like “ton”? And not a scrap or shred of evidence that the cost of running BART all night for partygoers and revellers could ever be cost-effective or justified? Some advice – don’t go on Shark’s Tank or The Apprentice. And don’t stand for public office – if you can’t even get a lousy parklet installed then you probably can’t convince us to invest millions for 24-hour BART. There have been lots of statements on here that it’s a ton. Plus it’s a valid observation. So that’s a lot of evidence according to you. I understand what a “ton” quantifies to when discussing weight. But the argument for all-night BART relies on paying customers and Murph’s term is useless for that purpose. Indeed it seems fairly clear that he has no real numbers to support his business case at all, and is therefore deliberately being vague and imprecise, hoping that nobody noticed. A useful low end proxy for the data you request is the ridership for AC Transit 800 and 801, which is the late night AC transit bus service from SF Mission to Oakland, Richmond, and Freemont http://www.actransit.org/wp-content/uploads/14-222a-Late-Night-Service-Public-Hearing.pdf Average weekend ridership in 2015 for the buses that run between 12:30 AM and 2:30 AM on Saturday and Sunday is 1,195. Given the fact that bus service is far inferior to BART, it’s still pretty telling that there are almost 600 people per night in those first two hours after BART closes who are using this service to get across the bay. So that’s 300 riders an hour for the first two hours. And presumably less after that? And that’s the week-end when there are more people staying out later? So let’s say 2,000 riders per night on week-end nights and 1,000 at night on school nights? Worth running trains? Assume $5 a trip so revenues are $10,000 for a week-end night. Cost of operators, signalling staff, maintenance staff, security, ticket office staff etc? wrong, he is in Las Vegas working for a labor union. He was flipping foreclosures. Maybe he’s doing something else now. Either way he’s on a decline. Up until a year ago, I’d routinely ride the last East Bay-bound BART train of the night and I was always impressed by the large number of riders. The same can be said for the first train of the morning on Sunday, which seemed to always be very well used – often with most seats taken. From this rider’s perspective, there is a clear demand for longer BART service hours, especially on weekends. That’s a very good question! Making a demand for 24/7 service is not worth it to those not using the service during the extended hours if the cost of service goes up to maintain those extended hours, and those costs are passed onto its riders. That’s true. BART service though should be running between San Francisco, Oakland and Berkeley. The dense cities. From SPUR: See your neighborhood through the eyes of your district supervisor! Join Supervisor Scott Wiener on this walking tour of sites in the Castro and Mission Dolores. Supervisor Wiener will take us to some of his favorite spots, but with only one hour, we won’t see it all.